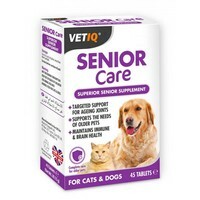 VetIQ Senior Care for Cats and Dogs has been specially formulated for older cats and dogs, who are showing signs of slowing down, fatigue and sluggishness. VetIQ Senior Care contains a blend of Chondroitin, Glucosamine and Green Lipped Mussel and has been specifically designed to deliver targeted support for ageing joints. Each tablet also contains a full complement of vitamins, amino acids, minerals and Ginseng which are proven to help maintain the immune system and aids in increasing energy and stamina during physical activity.